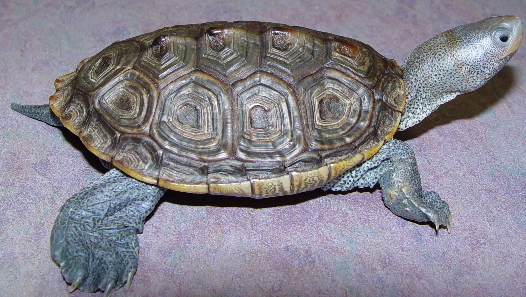 Aquatic turtles are very common as pets. Unfortunately they are also more difficult to care for than most people realize. 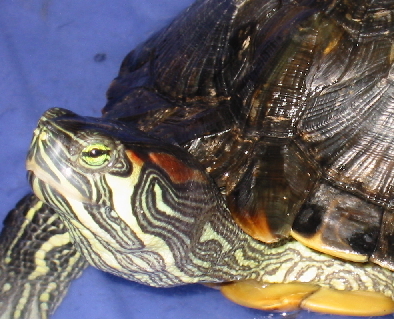 Often times, inadequate care results in various health problems for turtles. The most common turtles currently seen in the pet trade are: sliders, painted turtles, soft shell turtles, snappers, mud and musk turtles and map turtles. Keep in mind that many other species are available, and one should always research the natural history of a particular species of turtle to properly care for it. 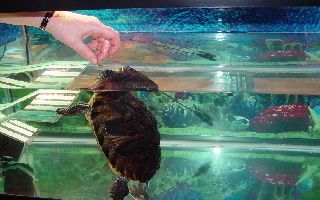 his varies according to size, number and species of turtle being kept. 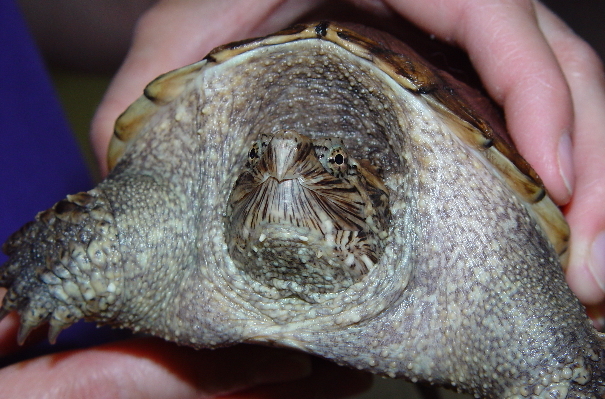 A good rule of thumb for minimum cage size is that the combined carapace (shell) size of all turtles should not exceed 25% of the enclosures’ floor surface area. 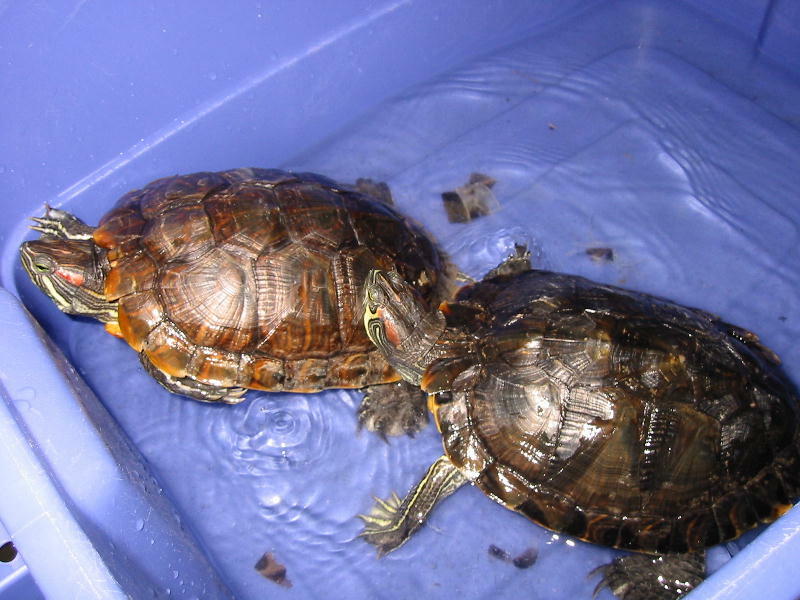 This is absolutely one of the most important aspects of an aquatic turtles’ health. Poor water quality can quickly cause shell infections or even death. We recommend a bare bottom tank. A gravel bottom is harder to keep clean and turtles will often eat smaller pieces of gravel, which can cause serious problems. A good filtration system is necessary. The kind of filter you get depends on the size of the tank and number of turtles in the tank. Canisters filters or over the side filters are recommended. Remember to change the filter media frequently. Frequent water changes are necessary even if a good filtration system is in place. If the tank water begins to have an odor- it is overdue for a water change. Use a dechorinator (and potentially one that handles chloramines as well). Periodically scrub and rinse the enclosure well to help remove residual bacterial growth buildup. After a water change, be sure to allow water temperature to return to normal rage before returning the turtle to its tank. 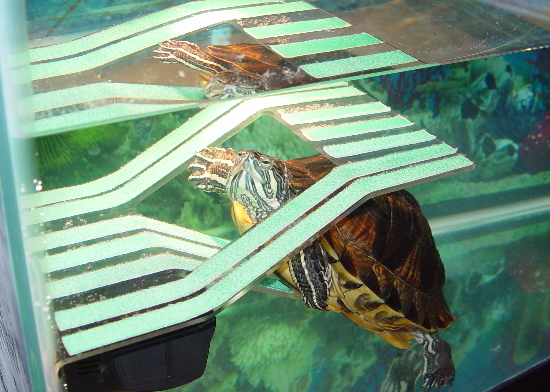 Rapid water temperature changes can harm turtles. Salinity. Research your turtle's salt requirements. Some species require a higher or lower salinity at different stages of development. Use a hydrometer to measure your water salinity and adjust as necessary. I use the sea salt made for salt water aquarium fish when creating a brackish environment. Unclean water conditions will cause severe shell erosion and ulceration, dermatitis, anemia, sepsis, and death. Compare the healthy slider on the left to the poor fellow on the right. Notice the differences in the skin and shell condition. The fellow on the right became ill because of being kept inappropriately. He will take months to heal and will be permanently scared. 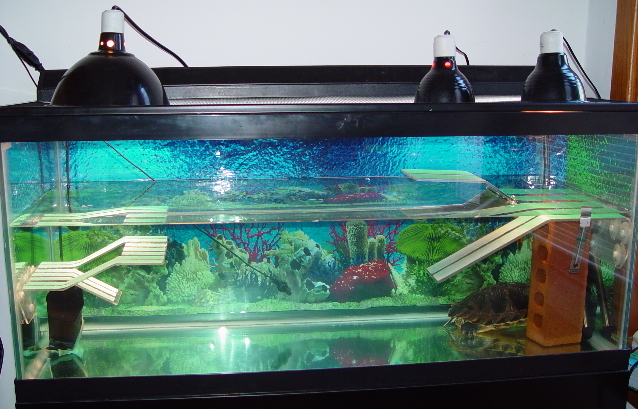 ​A dry area is necessary for the turtle to crawl out of the water, dry off and bask. 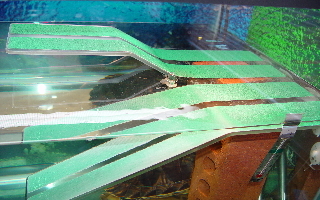 The area can be made of a variety of materials but should allow the turtle to be completely out of the water and sturdy enough that is won’t collapse or tip over and trap a turtle under water. There are some great acrylic ramps being made that are perfect for this purpose. The air over this area should be slightly warmer than the surrounding air temperature. (80-85 degrees) This can be accomplished using a light bulb and reflector hood directed at the site. A low wattage mercury vapor bulb works well. The bulb wattage will need to be adjusted according to the tanks’ environmental conditions. Remember to always use a thermometer. Herbivorous - Offer commercial pellet mix and a variety of greens including: kale, mustard greens, collard greens, and dandelion greens. Also, some aquatic plants such as hornwort and anacharis can be offered. Omnivorous - Offer a variety of foods from both lists. 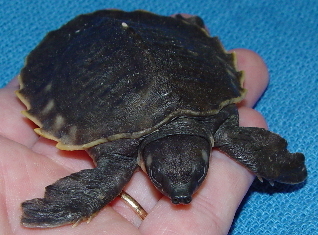 Many turtles are carnivorous as juveniles and become more herbivorous as they mature. Adjust their diet accordingly. A full spectrum fluorescent or mercury vapor bulb providing UVB light should be provided over the tank. Fluorescent bulbs should be no more than 12” from the basking site and should be placed on a timer to provide 12 hour light and dark cycles. The fluorescent bulbs need to be replaced every 6-12 months, mercury vapor, every 3 years. There also should not be any plastic or glass between the bulb and the animal. A screen to is acceptable. 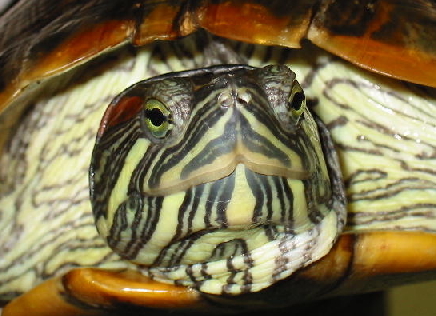 At any sign of illness, the turtle should be checked by a veterinarian familiar with reptiles. The most common household hazard for turtles is dogs. A dog can easily puncture the shell causing serious and life threatening damage. 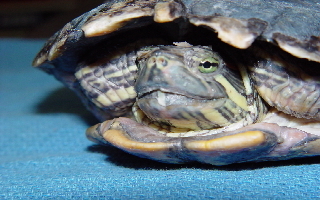 A turtle bitten by a dog should immediately be taken to a veterinarian. Common Snapping Turtle (juv): Chelydra serpentina sp.